DEIA Living single flat sheet are designed with style yet elegance in mind. 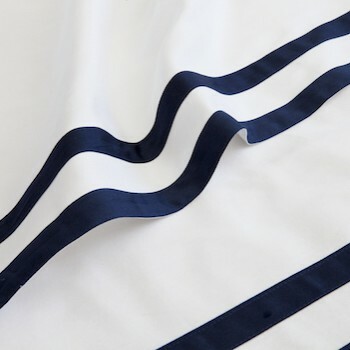 Made in Portugal and coming in a range of thread counts from 280 to 600 in 100% Egyptain cotton or long fibre cotton percale and sateen our single flat sheet will ensure a comfortable nights sleep. The generously sized flat sheets are predominantly white with each collections having a line of different detailing at the head of the sheet with touches of colours inspired by the mediterranean islands such as almond, sky blue, stone, honey, ash, white, navy caramel and mink. Our top of the range 600 thread count collection "Tremiti" is a 100% Egyptain cotton sateen coming in white with an elegant chain stitch detailing in stone or caramel that crosses in the corner of the 5cm oxford border. The exquisitly smooth sateen will make you feel as if you are in a boutique hotel the moment you slip under the covers. Our 300 thread count Egyptain cotton collection "Saria" comes in all white with ladder stitch detailing sitiing on the edge of a 5cm oxford border. The elegant ladder stitch detailing gives a classic yet romantic twist to your bedroom decor. Our 280 thread count sateen collection "Formentera" comes in 100% Egyptian cotton with a double applique border of sateen in either navy, ash or honey creating this a distinct statement look. Our 400 thread count long fibre combed cotton percale collection "Elba" comes in white with mink, almond or sky blue cord embroidery just before a 7cm oxford border. Hotel-luxe inspired, its tailored simplicity molds perfectly to any bedroom space be it town house, beach house or inner city apartment. Appropriate for all climates of Australia, you can complete the look of your bedroom by adding a matching quilt cover and/or mix of tailored pillowcases making your bed the focal point of your bedroom. As seen in ELLE Décor, DEIA Living bedding and single flat sheet are particularly popular as wedding, house warming, or "just because" gifts.